You guys know what a patty melt is, right? It’s basically a grilled cheese with a burger slapped in the middle. It’s crunchy, it’s meaty, it’s hella cheesy, and yeah, it’s kind of greasy – that’s part of the fun. By looking at a conventional patty melt, you might wonder “how could this ever be vegan?” which is exactly what this post is about! Thanks for joining in. Let’s show thanks for the CEOs, food scientists, and heck, even to the greedy investors trying to make a buck off vegan food culture, because they’re all part of the reason why have juicy burgers, melty cheese, and rich butter made entirely from plants. It’s because of these people that this vegan patty melt is allowed exist; without them, this sandwich would be nothing more than some pickles between two slices of dry toast! Okay, since this sandwich is made up predominately of substitutes, let’s talk specifics, because the quality of products and brands you use are going to make a big difference in the end. First off, we’re going to need some butter, which we’ve already covered on the blog a few times, but to rehash your memory, our favorite brands are Miyoko’s and Melt. Miyoko’s has amazing body & flavor, and it browns just like regular butter, but it does sit on the expensive side of the spectrum. Melt, on the other hand, is impeccably rich, remains spreadable at refrigerator temperatures, and costs between $4-$5 per container, making it our butter of choice! Next up is cheese, and there’s quite a few good brands to choose from these days, from Chao to Daiya to Follow Your Heart. Just like with regular cheese, everyone is entitled to their own opinion, but let me tell you, from a completely biased standpoint, what brand you should buy: VioLife. All of their products are great, but their Mature Cheddar Slices are absolutely PERFECT for this application. … Okay, maybe you won’t find VioLife in Tampa, in which case you can just go with Provolone or American Slices by Follow Your Heart or whatever your favorite is… I guess. Alright, we’ve finally arrived at our last point: meat. Or lack there of! In our eyes, there’s only two semi-realistic burger replacements out there right now and that is the Beyond Burger and Impossible Burger. While we’re partial to the Impossible Burger, it’s not sold at grocery markets yet, which leaves us with one option: the Beyond Burger. And that’s fine by us because this burger is meaty, tender, chewy, juicy, and perfectly greasy, which is exactly what you want inside a patty melt. But that’s not all folks, because we’re inviting bacon to this party too! I’ve tried my fair share of bacon substitutes throughout the years, only two of which actually nailed the look, texture, and flavor of real bacon, but unfortunately, those aren’t sold at major markets either. That’s alright though, because even if bacon substitutes don’t look or taste exactly the same as the original, they still have that chewy, seasoned, salty, smoky flavor. Just like with cheese, you’re entitled to your favorite brand, but we’re gonna tell you which one’s right anyways: Benevolent Bacon by Sweet Earth. It’s got big bacon flavor with a chewy texture, making it the perfect addition to our melt. Okay guys, it’s time to head to the store, load up on some vegan junk food, and assemble our masterpieces, because we’re waving goodbye to mushy black bean burgers, tofu cheese, and underwhelming wholegrain bread. Today we raise the standards of what vegans everywhere eat. Juicy Beyond Burger patty, melty aged cheddar cheese, tart pickles, and smoky bacon sandwiched between butter-toasted French bread. Heat a small sauté pan over medium-high heat. Once hot, cook enough vegan bacon to cover the surface of your bread (about 3 slices) with a touch of oil until lightly browned on both sides; about 2 ½ minutes per side. Set aside for now. Sprinkle Beyond Beef patty with salt, paprika, garlic powder, and pepper on both sides. Heat same pan bacon was cooked in over medium-high heat. Once hot, add in burger, press it down with a spatula to flatten it slightly, and cook until seared; about 3 minutes per side. Set aside. If you have a sandwich press, now’s the time to use it. If you don’t, you can do what we do: place a cast iron grill pan over medium-low heat and let it heat up for 6 minutes. While cast iron heats up, spread butter on one side of each slice of bread. With the butter facing out, place two pieces of vegan cheese on the bottom slice, followed by a thin layer of red onions, burger patty, pickles, two more pieces of cheese, bacon, and top slice of bread, with butter facing out again. Once bread’s lightly browned – about 4 minutes – remove the cast iron pan on top, carefully flip sandwich with a spatula, place cast iron back on top, press down again, and cook until toasted on second side. Transfer to a cutting board, cut in half, and enjoy while fresh! *We prefer French bread for its square shape, refined texture, and sturdiness. However, any rustic square bread will work here; sourdough & rye are other great choices! First off, I LOVE the name of this, how great is this!!! 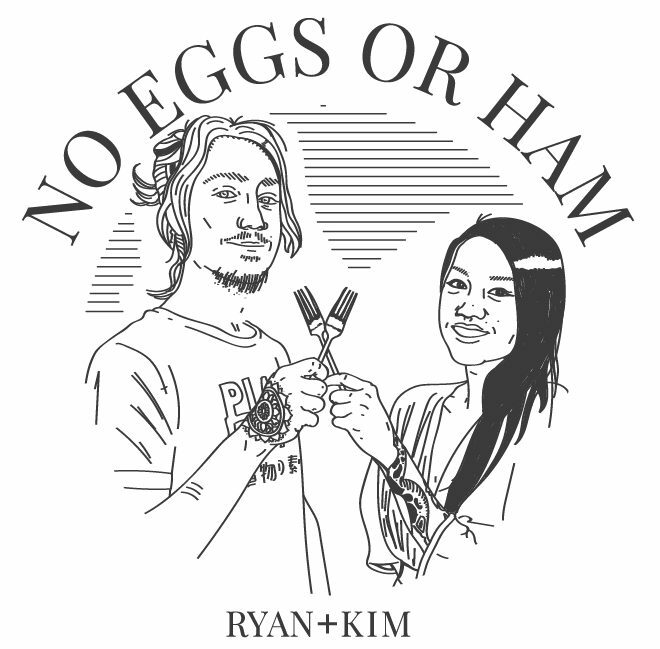 No eggs or Ham! marvelous. Second, this looks delicious, thanks for mentioning the name brands you use, that helps me out a lot I am still sampling cheeses and CHAO has been my favorite so far but I’d love to try others. I’ve heard you can get the “impossible burger” “meat” in the meat section at Whole Foods. It’s where they sell meat/ground meat. You just have to ask for it at the counter. I’m gluten-free so I haven’t tried to do that but someone told me they got it there. It’s not frozen like the beyond patties (which I love). Whoa, thanks for the tip! I’ve never heard of that, nor did I know that Whole Foods carry Impossible Burgers, but I’ll have to check that out. Also, Impossible Foods recently updated their burger formula, improving its texture & making it gluten-free! Not every place that carries them has the new formula yet, but they’ll eventually replace all of the originals with the updated, gluten-free version.